Breakfast is an important meal of the day for everyone. Proper breakfast provides you with the energy to function throughout the day, or at least till the lunch hour. It is the first meal of your day and it sets the tone for how your day is going to be; lethargic or energetic. 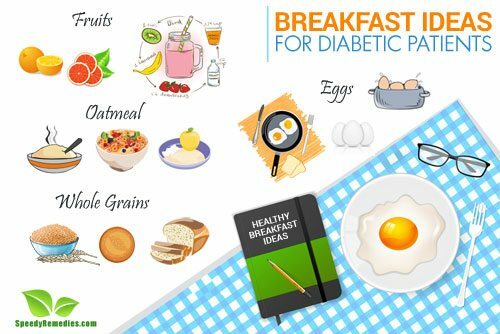 For people with type 2 diabetes, breakfast is of even more prominence. Eating a full breakfast with proper nutrients is linked to aiding in weight loss, which can in turn improve the blood sugar levels and insulin sensitivity. Also, skipping breakfast can make you feel more tempted towards food with high sugar content. According to study published in American Diabetes Association in 2015, skipping breakfast leads to spikes in blood sugar after lunch and dinner, in people with type 2 diabetes. It was also found to negatively affect the efficiency of the body in processing glucose. This means that the body’s capability to convert sugar into energy is reduced. Eggs are considered a great food choice for people with diabetes. Eggs have high protein content and very less carbohydrates, which does not raise your blood sugar levels. They are also low in calories and can be prepared in a number of ways. Scrambled Eggs and Toast- This traditional breakfast dish is a pretty healthy option for diabetics and non-diabetics alike. Just scramble the egg in a non-stick pan so as to reduce the amount of cooking oil and enjoy with a whole wheat toast. You can top it with a low fast cream cheese, if you like. Hard-boiled Eggs- These are easy to make and can be prepared in advance for the entire week. Just make a batch for the 6 days in one session and save the hassle and time for the rest of the days. Eggs Benedict- Another popular breakfast option, eggs Benedict are a healthy choice. Remember to use light sour cream and fat free milk. Also, go for a whole wheat English muffin rather than flour ones. Eggs and Tortilla- This is a quick breakfast idea. Scramble the eggs in a non-stick pan, use a cooking spray if possible. Now put the egg in a whole wheat tortilla and add some sliced tomatoes. Pour some sauce on it and eat it on the go. Fruits are healthy, period. They are good for everyone and are fun to eat. It doesn’t hurt that they look good too, apart from tasting delicious. Raw and Fresh- Fruits like orange, grapefruits have high vitamin C content. Oranges also contain folate and potassium which can help in regulating blood sugar levels. Apples are also loaded with fiber and vitamins. Berries are good antioxidants, while kiwis have low carbohydrate content. Pears, bananas and peaches are a good choice too. Make a Smoothie: Take ½ a cup of non-fat plain Greek yogurt, 2tbsp of low fat milk and ½ tbsp of frozen fruit. Now blend it all together. Pour it in a glass and sprinkle some cinnamon on it, if you like. There, your uber cool and healthy drink is ready to go! Fruit Salad- Dice your favorite fruits into small cubes and mix them together in a bowl. You can opt for pineapple, apple, bananas, mango, kiwi, strawberries or Clementine. Add some lime juice, salt to taste and sprinkle it with pepper. Add 2 tbsp of powdered sugar to combat the tangy taste. There you go. Your fruit salad is ready to be eaten. It can also be refrigerated and eaten at a later time. Besides, it tastes delicious when chilled. Do not store for more than 3 days. Fruits and Cereal- You can make your whole wheat breakfast cereal even more healthy and delicious by adding half a cup of fresh fruits like strawberries and blueberries. Also, remember to use low fat milk when eating your breakfast cereal. Oatmeal is the healthiest, most nutritious and tasty breakfast option there is, especially if your blood sugar levels are high. It contains 4 grams of fiber per cup which keeps the blood sugar levels stable. It is also keeps you satiated, thus making you eat less throughout the day. It is pretty quick to prepare or you can buy the pre-prepared ones from the market although these have high sugar content. The healthier alternative would be to buy steel cut or Irish oats and cook them using a rice cooker. You can add Greek yogurt, berries or nuts for extra flavor and nutrition. Quick Oatmeal- Take ½ a cup of quick oats and mix it with ½ a cup of water. Cook it in the microwave for about 1 minute or until the oats are cooked. Now add your preferred topping(s) to it, like roasted nuts, dried fruits etc. Trail Mix Oatmeal- Take ½ cup granola, 8 chopped pecan halves and 2 tbsp of raisins and add it to a bowl of hot cooked oatmeal. Stir it to mix well. Now top it off with some cinnamon. Your oatmeal is ready to go! Banana Nut Oatmeal- Add 40 oz of diced banana and 4 walnut halves to a bowl of hot cooked oatmeal. Mix well. You can serve it with a glass of skimmed milk. Whole grains are grains that contain the entire grain, as compared to the refined grain that contains just the endosperm. They are good for your bowel movement and enable the growth of good bacteria in the colon. Whole grains diet also reduces the risk of heart problems, weight gain and diabetes. Muffin Parfait– Muffins are a national favorite in this country, and are a staple item in breakfasts. These small sized breads with individualistic servings are a good choice for breakfast. Halve a bran muffin or other high-fiber muffin, cover with a side of berries, and top with a dollop of low- or nonfat yogurt for a fast and easy breakfast. Whole Grain English Muffin– A whole grain English muffin is different from the American muffin, but since they are both called muffin we included them both here. Whole grain English muffins can be eaten with eggs or topped with peanut butter/avocado/low fat ricotta. These can be bought from the market and stored in the freezer. Just defrost and heat one in the microwave when you want to eat them. Whole Grains Bread– You can use whole grain breads to make French toast or pancakes. Top your French toast or pancakes with a tablespoon of peanut butter or no-sugar-added fruit instead of sugary syrup. Take ½ cup of cottage cheese and mix it with ½ a cup of canned peaches/pineapples/raspberries. Add a handful of nuts if you like. Eat bagel thins by topping it with peanut or almond butter. This will provide with a healthy dose of carbohydrates, fats and proteins. Instead of drinking juice, eat the fruit. Juices are not nearly as nutritious as the fruits themselves. Also, pre-packaged juices are likely to contain high concentrations of sugar. When preparing tea, add a cinnamon stick to it. You can add cinnamon powder to grounded coffee when making coffee. Cinnamon lowers sugar levels in the blood. Sprinkle 1-2 tbsp of flax seeds on your yogurt or cereal. They are rich in fiber, protein and omega 3 fatty acids which protect your heart and keep your blood sugar level in check. Have oatmeal regularly, especially in winter. It keeps you from eating other sugared foods because of how full it makes you feel.